Honey is a delicious substance made by honey bees around the world. 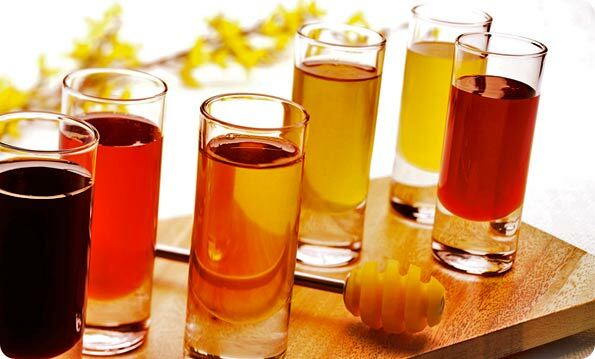 More specifically, honey is a sticky substance made mainly of fructose, glucose, and water. It also has natural sugars, minerals, and vitamins. Beekeepers get the honey from their bee yards, bottle it, and send it to stores. Mike's Apiaries is a family run business; most of our honey is sold at various stores and markets. Honey bees travel from flower to flower collecting pollen and nectar to bring back to the hive and make honey. Honey bees can travel as far as 55,000 miles and visit as many as 2 million flowers to gather enough nectar to make just a pound of honey. Beekeepers go out to the hives with special tools to collect the frames from the hives, extract the honey from the comb, filter it, and bottle it. Most beekeepers will filter their honey, however at Mike's Apiaries we strain our honey. When getting comb honey beekeepers go to the hive, cut the comb off the frame, and package it. There is no heating, filtering, or straining. Comb honey is purest form of honey. Raw honey is extracted from the comb and heated to approximately 100 degrees Fahrenheit. It is then pumped through a strainer that lets the healthful minerals, vitamins, pollen etc. pass through and blocks the beeswax and impurities. The heat does no harm to the honey because the bees themselves keep the honey heated in the hives at approximately the same temperature the beekeepers do. The honey is then bottled and sold. Why (and how) do bees make honey? In addition to being a great natural sweetener, honey has a multitude of benefits that many people don’t know about. Have you ever had an unrelenting sore throat? Honey has been proven to be a natural throat soother! Are you an athlete looking for a natural energy boost before the big game? Honey’s unique blend of natural sweeteners gives it the ability to provide quick energy in any circumstance. These links will allow you to further explore these and other benefits of honey. Nutrition facts for real honey.